Dandruff are he common medical problems occurs in almost 50% of people in the world. Having dandruff’s can put you sometime in an embarrassing situations when you are well dress up going for an occasion and you see something like white scalp on your shoulders all around. Dandruff, also called Seborrhoea, targets the scalps of many people, young and old. Here, we have listed top 10 natural home remedies for dandruff cure. Poor hair brushing and shampooing habits, dry skin, stress and improper diets, will make your scalp more prone to dandruff. Dandruff may be the result of a dry scalp, or a skin condition called seborrheic dermatitis. It could also be caused by eczema, psoriasis, or, very commonly, an overgrowth of a yeastlike fungus called malassezia. This scalp condition is caused by a fungus, Malassezia, which feeds on sebum (the oily matter secreted by the sebaceous glands on our scalp) and the dead skin cells which occur naturally due to formation of new skin. 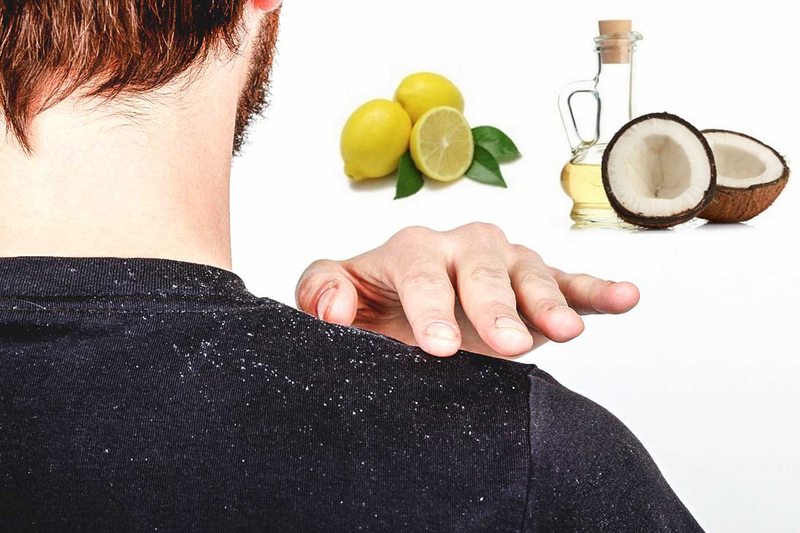 Home remedies are an effective way of treating dandruff. The remedies are simple and the ingredients can be found in your kitchen. So, go ahead, find the remedy that best suits your hair. Massage the juice on your scalp and leave it on for 15-20 minutes. Wash your hair as usual. Massage lemon juice on your scalp before going for a shower. Wet your hair and then rub a handful of baking soda vigorously into your scalp. Skip the shampoo and go right to rinsing. Baking soda reduces overactive fungi that can cause dandruff. Your hair may get dried out at first, but after a few weeks your scalp will start producing natural oils, leaving your hair softer and free of flakes. Vinegar helps in treating itchy, dry skin and also helps to kill dandruff-causing fungus and bacteria. The acidic content of vinegar is supremely beneficial to drastically reduce flaking. Apply an equal quantity mixture of white vinegar with water on the scalp skin about half an hour before a head wash. Apply the mixture to your scalp and rinse it out with cold water and shampoo after 2 hours. All of us are aware of the role that neem extract plays in almost all skin medications because of its antibacterial and antifungal qualities. Since dandruff can mostly be attributed to fungal colonization of scalp, it is only right to turn to this age-old remedy for skin ailments. Natural is always the best way to go; however it is cautions to use a very diluted version of neem (neem boiled in water) for the scalp as concentrated versions may only irritate the skin further. Crush two tablets of aspirin and mix with your shampoo whenever you wash your hair. Follow it up with a wash suing plain shampoo to get all the medicine out of your hair. Aspirin contains Salicylic acid, which is a common ingredient in most anti dandruff shampoos and is very effective in treating dandruff. What to do: Combine rosemary oil with vinegar and apply it to your scalp for 15-20 minutes. Wash off as usual. Coconut oil is a genuine dandruff treatment, and it smells nice too. Before showering, massage 3-5 tablespoons of coconut oil into your scalp and let sit for about an hour. Shampoo normally. You can also look for a shampoo that already contains coconut oil. Coconut oil has lots of other great beauty uses as well. Treating dandruff at home with curd is a little messy but very effective. Method for using curd as a home remedy for dandruff. Apply some curd to your hair and scalp and let it sit tight for about an hour. Than, rinse it off with a shampoo that’s mild.